I made a small, very simple tutorial of how to make a leopard print. Although it is so easy I don't really find any need to make it more advanced. I use a liquid eyeliner to make the spots. I prefer a eyeliner-brush and cake eyeliner but you can use any liquid eyelier or pencil for that matter although I wouldn't reccomend a pencil since it's much harder getting it nice and clear. Take the brush and draw the spots by making two "lines" one on top and one under. Sometimes make the lines go into each other and sometimes just make a completely black spot. Do just as you please and remember that no two leopard spots looks the same. 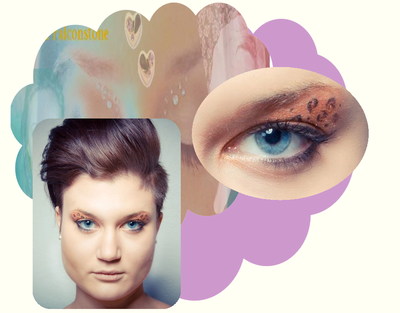 You can put the leopard print wherever you like; on the eyes, lips, forehead, literally wherever you find it looks nice. 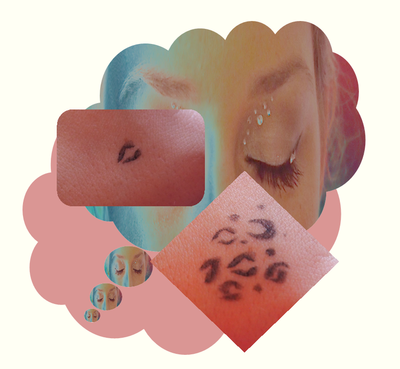 You can fill the leopard spots with eyeshadow, eyedust or glitter if you like as this enhances the effect of the spots and me I love putting some shimmer or glitter in there! I'm back, at least I think I'm back and as you can see there has been some changes. The look of the blog has completely changed, as has the language in which I'm writing. This may seem a bit odd but since some of my closest friends doesn't understand a word Swedish I'm trying it out. As my first post back I am going to show you all beautiful Mariella that I styled for a photoshoot with Henrik Martinsson, a very talented up-and-coming photographer here in Sweden. The focus lies on the eyes and I've bronzed the whole of her eyelid adding som leopard print and some sparks finishing off with black eyeliner and mascara.